Let us see the pAsuram and its meanings. nam param Ayadhu uNdE – (when he is biased towards his followers as a protector) is there any responsibility for us in our protection? thOnRinEn – was I born? umbarAl aRiyalAgA oLiyuLAr – the word umbar refers to celestial people such as brahmA in the upper worlds upto sathyalOkam. oLi refers to SrIvaikuNtam which cannot be understood by those such as brahmA and oLiyuLAr refers to paramapadhanAthan (emperumAn) who dwells in SrIvaikuNtam. chAndhOkya upanishath 3.13.7 says “atha yathatha: parO dhivO jyOthir dhIpthyathE viSvatha: prushtEshu sarvatha: prushtEshu anuththamEshUththamEshu lOkEshu” (in paramapadham, that which is superior to individual and collective entities, that which is without anything superior to it, that which emits radiance in higher reaches). mahAbhAratham AraNya kANdam 136.18,23 says “athyarkAnaladhIptham thath sthAnam vishNOr mahAthmana: I svayaiva prabhayA rAjan! dhushprEksham dhEvathAnavai:II thahtra gathvA punarnemam lOkamAyAnthi bhAratha! II “ (Oh king! That place belonging to mahAthmA vishNu is more radiant than sun and agni [god of fire]; because of its radiance, it cannot be seen by celestial and demoniac entities; Oh, one who was born in the clan of bharatha! No one, who has ever gone there, has returned). Thus, mahAbhAratham also mentions that SrIvaikuNtam cannot be seen by celestial people. aRiyalAgA – even people who have high levels of gyAna (knowledge), as said in bhagavath gIthA 16.14 “ISvarO’hamaham bhOgI sidhdhO’ham bhalavAn sukhI “ (I am ISvaran (one who controls everything and everyone), only I attain all enjoyment, I am endowed with supernatural faculties (by nature); only I am endowed with strength and I enjoy all comforts (by nature)), such as brahmA and Sivan, who think that they are ISvaran cannot attain paramapadham. Not only can they not attain it, they cannot know about it. Such is paramapadham. 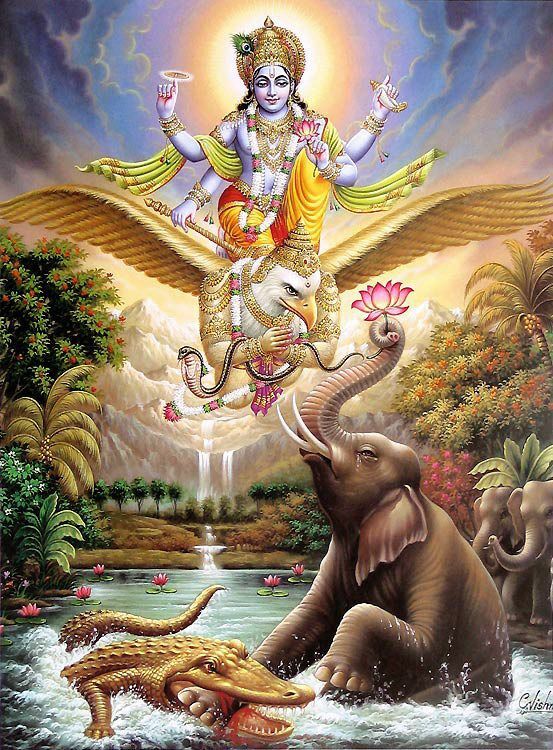 SrIvishNu purANam 1.9.55 says “yanna dhEvA na munayO na chAham na cha Samkara: I jAnanthi paramESasya thath vishNO: paramam padham II “ (the one place which celestial entities, sages, I (brahmA) and Sankara do not know of, that is vishNu’s paramapadham). Thus, brahmA also spoke about this supreme place. oLiyuLAr – mUnRam thiruvandhAdhi 51 says “kalangAp perunagaram” (the calm, supreme place). One who is enjoying nithyasUris (permanent dwellers of paramapadham) constantly, came to samsAram to protect a suffering person such as I.
AnaikkAgi – such an emperumAn, with unbounded eminence, came with dress astray and hair dishevelled in great hurry. Did he come for pirAtti or thiruvadi (garudan) or thiruvananthAzhwAn (AdhiSEshan) or such great entity? No, he took so much of effort for an animal. If one looks at the difference between the suffering elephant and the helping emperumAn, it is something between a pond and a mountain. If he has to protect a follower, he does not look at his greatness or the lowliness of the follower. He only looks at the danger that his follower is in and the inseparable relationship between him and his follower, is the considered opinion here. Let him not see the lowliness of the follower. Was the enemy befitting the stature of emperumAn? Who was it, who created such an anger in emperumAn? sem pulAl uNdu vAzhum mudhalai mEl Siri vandhAr – the one which gobbles up different types of fish which are much lower than itself, as a result of which it thinks that it has got a fullness equivalent to emperumAn, as mentioned by nammAzhwAr in thiruvAimozhi 4.5.1 ”vIRRirundhu Ezhulagum thanikkOl seyya “ (ruling all the worlds, sitting in paramapadham) – it was a worm in the water [that is how vyAkhyAthA describes the crocodile] on which he came with a rage. SrIvishNu purANam 1.9.25 says “yadhAvath kathithO dhEvair brahmA prAha thatha: surAn I parAvarESam SaraNam vrajadh vamasurArdhanam II” (brahmA, who was informed of the sufferings of the celestial entities, told them that the one who is ISvaran to all without any difference between the great and lowly people, the one who is the opponent of demons, take refuge under him, the emperumAn). If emperumAn had destroyed demons in order to protect brahmA et al who came to surrender to him to protect them from their enemies, it would not have been considered as anything wondrous. What is wondrous is that he came with a rage to protect an elephant which called out to him, to kill its enemy with his dress and hair in dishevelled condition considering it as a great enemy. SrI rAmAyaNam AraNya kANdam 24.34 says “krOdha mAhArayath thIvram vathArtham sarvarakshasAm I dhushprEksha: sO’bhavathkrudhdhO yugAnthAgniriva jvalan II “ ((SrI rAma) brought on himself deep anger to kill all the demons. He appeared like a huge ball of fire, a rare sight to behold). When someone commits an irreverent act on emperumAn, emperumAn remains calm, as said in SrI rAmAyaNam ayOdhyA kANdam 1.10 “sa cha nithyam praSAnthAthmA “ (perumAL is always peaceful). But he changes his nature and brings on anger when he sees that his follower is put to difficulty by an irreverent act, as seen in SrI rAmAyaNam yudhdha kANdam 59.136 “atha rAmO mahA thEjA rAvaNEna kruthvraNam I dhrushtvA pravaga SArdhUlam kOpasya vaSamEyivAth II “ (after that, SrI rAma, the splendrous person, became angry on seeing hanumAn, the greatest among monkey warriors, who was injured by rAvaNa). When he is this angry, he will not care whether the enemy is a lowly person or not and hence there is nothing wondrous in this. Just as thirumangai AzhwAr says in periya thirumozhi 5.8.3 “kodiyavAi vilangin uyir malangakkoNda sIRRam onRu uNdu” (there is a rage which killed the animal with cruel mouth), it is this great quality that people consider as their refuge. vandhAr – while he could have destroyed the crocodile from his place through his sankalpa (will), how wondrous that he came to the pond, with dishevelled dress and hair! If he wanted to annihilate the world, he could have done that with his will. To protect his follower, if he does not come in person and destroy the enemy with his own hands his anger will not subside, is the opinion here. It appears to AzhwAr that emperumAn, by coming that day to help the elephant, helped AzhwAr himself. Didn’t thirumangai AzhwAr describe the crocodile as “kodiya vAy vilangu” in periya thirumozhi 5.8.3, as if he himself had been caught in its jaws? The surmise here is that if we don’t think that emperumAn coming to help a follower is like helping ourselves, then we do not have vaiNavathvam (the fundamental nature of being a SrI vaishNavan). nam param AyadhuNdE – when emperumAn comes to protect his follower due to his bias towards his follower, is there any responsibility for us in our protection? If emperumAn looks at his greatness or at our lowliness or gets angry with the excessive sins that we have committed and decides “let this type of person suffer for some more time”, we can attempt to protect ourselves. When he is not like this, we have no basis for protecting ourselves. nAygaLOm – our lowliness is such that the elephant gajEndhran is at the level of rishis such as sanakar (mAnasa puthra of brahmA). Even if we enter houses where the doors are open, we are being driven out like unwelcome dogs; we are without a recourse. Even if the person who brings up a dog touches us, he has to take a bath [to get rid of dirt etc], such is our lowliness. siRumai OrA empirARku – however lowly we are, those who are unable to see our lowliness. Just as SrI vishNu sahasranAmam says “avigyAtha sahasrAmSu” (even with thousands of eyes, he is ignorant [of his followers’ faults]) he is ignorant of and blind to our faults and multiplies our [good] qualities with his thousands of eyes. muNdakOpanishath 1.1.10 says “yassarvagyas sarvavith yasya gyAnamayam thapa:” (which paramapurushan [supreme being] knows the true character and inherent nature of all entities, whose will is gyanamayam (full of knowledge)) – when emperumAn is praised as omniscient, what is the meaning of saying that he does not see our faults? He does not judge the extent to which he should help after seeing the faults in his followers. He ignores the faults and even considers the faults as good qualities. empirARku – thus, not looking at our faults and protecting us considering the danger that we are in, being our ordained Lord, AzhwAr refers to him as empirARku. Alternatively, em would refer to being his swAmy and pirARku would refer to emperumAn helping him. AL seyyAdhE – It is apt to serve such a Lord. Once emperumAn takes up our work as his responsibility, it is apt to submit our physical body and five senses to his service, as per our svarUpam (basic characteristics). Instead, AzhwAr laments that he is not doing that. En seyvAn thOnRinEnE – my birth has become wasted, says the AzhwAr. Just as sumithrA tells her son lakshmaNa that the purpose of giving birth to him was to help SrI rAma in forest, while the purpose of one’s birth is to carry out kainkaryam to emperumAn, AzhwAr says that since he did not do this, his birth is wasted. Instead of saying “piRandhEn” (was born), AzhwAr is using the term “thOnRinEn” to indicate that he appeared, like an achEthana (insentient) entity. While lakshmaNa was born to carry out all kainkaryams to perumAL, AzhwAr says that he “appeared” since he was not useful in carrying out any kainkaryam. We shall take up pAsuram 29, next. This entry was posted in mudhalAyiram, thirumAlai on October 30, 2016 by T N Krishnan.